I have great news: at the recent Frankfurt Book Fair, the rights to Dream on, Amber were sold to Sourcebooks in the US of A. WE’S GOING TO AMERIKEE! I wish I was going and not just Amber but maybe she’ll send me a ticket. She’d better or there’ll be trouble. 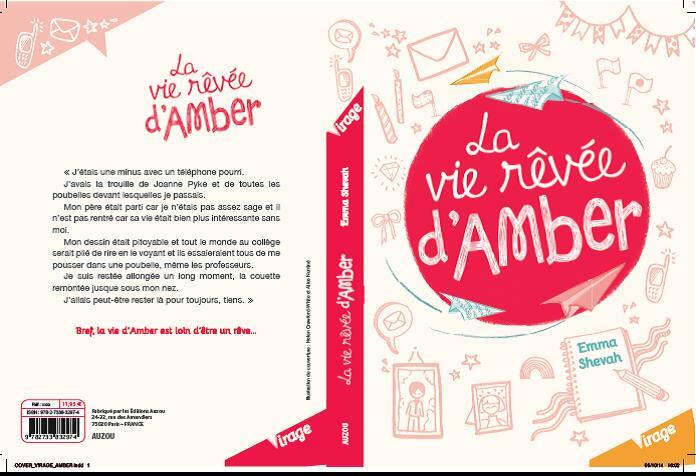 And I’ve just seen the cover of the French version of Amber and it’s lovely. I’m currently editing my next book, Dara Palmer’s Major Drama which will come out in May 2015, so it’s all happening. Lastly, I wanted to share the most wonderful review sent to Chicken House by Arouny, aged 10, whose father is from Laos and her mother is half English and half Chinese. Arouny lives in Paris and she is my kind of girl, and with a heritage like that, we’re sure to be lifelong friends. Arouny, thank you SO MUCH. Wow!!!! What a book! It was molto impressive (ha ha!). I absolutely loved “Dream On Amber”. I really liked the idea of the numbers of the chapters in the three different languages Amber speaks. The doodles are cool too. I could really feel Amber’s emotions and worries. Emma Shevah can really communicate Amber’s feelings to the reader, which asks lots of potential and imagination woven together. Bella may have grubby fingers but she’s so cute (though she does seem excessively annoying-but aren’t all little sisters supposed to be like that?) and her letters are so so sweet! The moral of the story is to be glad with what-and in this case who-you have. Amber and Bella may not have their father but they have their mum and Nonna-and each other, of course. Oops!! I didn’t realise I’d written so much! I got a bit carried away it seems!